So you saw your Filipino friends using Baybayin (a.k.a. Alibata to the uninformed) characters on Facebook and you wondered how they do that, right? Well, if you're not that tech savvy - here is the secret: it's called Unicode. This typepad application converts typed text to the Baybayin Unicode character equivalent and vice versa. To type Baybayin Unicode, select the "TYPE Baybayin Unicode" option from the drop-down menu on the top-left of the app. There are 2 Typing modes; the x Mode automatically types a virama below each character making them stand alone consonants, while the a Mode types syllable characters with the default 'a' vowel sound. Depending on which mode you use, typing vowels or kudlit marks after each character alters the default 'a' or cancels an auto-typed virama. The ·· check-box allows double kudlit marks that repeats a same-vowel syllable. It is automatically unchecked after each double kudlit is typed. After typing in Baybayin Unicode characters, you can highlight your characters and copy (simply click on the ⇩ copy button) then paste & post the glyphs in Facebook or forums or anywhere else on the web for that matter. Anyone with a web browser that is set up to view UTF8 and have a Unicode compliant font installed in their computer that has Baybayin characters in the appropriate range (Tagalog range: U+1700–U+171F), would be able to see the Baybayin characters you posted. To convert Baybayin Unicode to text, select the "READ Baybayin Unicode" option on the drop-down menu, copy then paste the characters you wish to convert onto the text area, then click the "conv" button. You can scroll up or down on the text area using your mouse wheel. 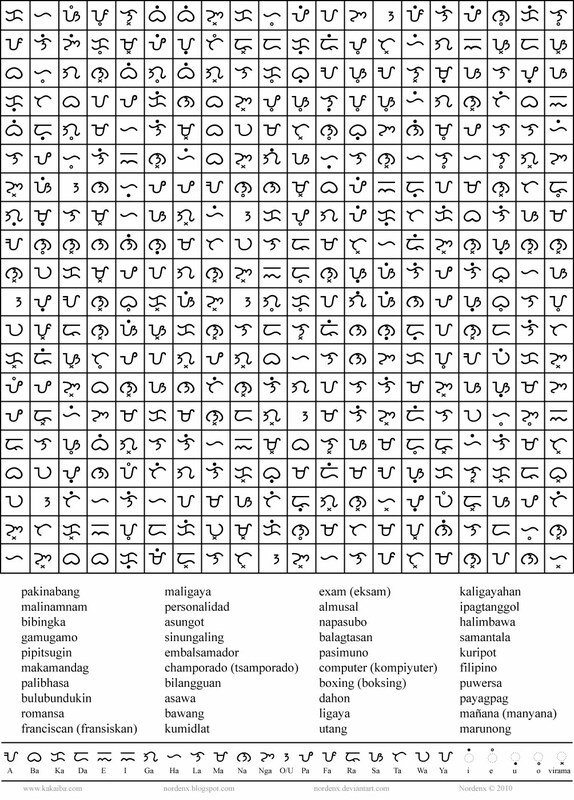 To learn more about how to write in baybayin, please visit this - list of pertinent Baybayin links. Type using your keyboard at a normal speed, not too quick as network lag can slow down processing and will end up skipping characters. The app only converts every text character typed the end of the word/sentence, letters inserted in between other characters will not be converted. Warning! This is not a translator application. Do not rely on this tool for correct spelling and transliteration. This is a free-form learning tool. Unless you're already proficient with Filipino languages and Baybayin script, transcribing is best left to professionals. PLEASE GO TO THE DOWNLOAD PAGE FOR A MORE UPDATED LIST. In the deviantART page for each font, look for the download link in either the text description or the download arrow button located at the upper-right side of the page. All of Nordenx Baybayin Modern Fonts are for personal and non-commercial use only. Please contact me at nordenx@yahoo.com for any inquiries about commercial use in publications or electronic applications. Ukyabít - a Baybayin card game! 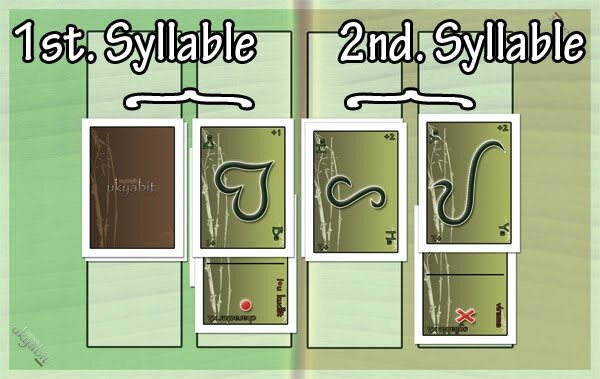 This is a radical Filipino alphasyllabary card game where you learn to use Baybayin script characters to build simple two to four syllable Tagalog words. Ukyabít is a revolutionary new and fun approach to word puzzle card games and language learning. It's not complicated but don't think it's simple. First, you have to know the Filipino language and Tagalog syllabary. Next, you have to learn how use Baybayin script to build two to four syllable Filipino words. And of course you have to employ some strategy to get those high scores. I found that these two popular word puzzle formats are good teaching tools and learning exercises and would work well with Baybayin. Thus, I will include a bunch of them in my book. 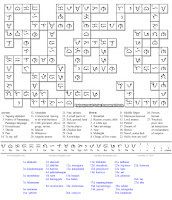 Baybayin Crossed-Scripts Puzzle is a revolutionary new approach to crosswords puzzle solving and language learning. 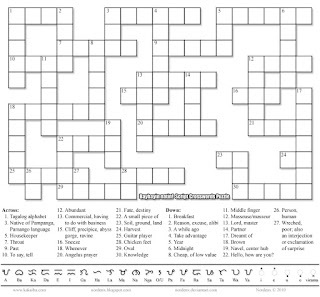 Baybayin Crosswords uses the established crossword puzzle format loved by millions worldwide; however, the clues are given in English whereas the answers must be completed using Filipino words (Tagalog, Ilocano, Bisaya, etc.) written in Baybayin script's syllabic characters. 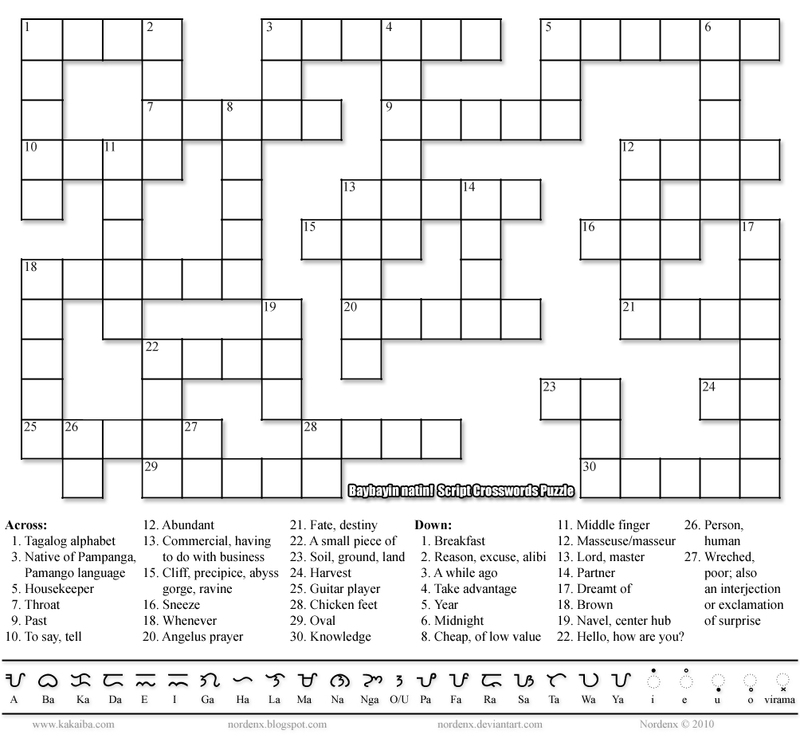 This puzzle challenges the person's language translation, word knowledge, script handwriting, Filipino phonetics and syllabary skills. Click on the image to view its actual size. You may print it using your printer and distribute the copies and share the link back to this blog freely. However, you may not use these images for commercial purposes or publications without prior consent. 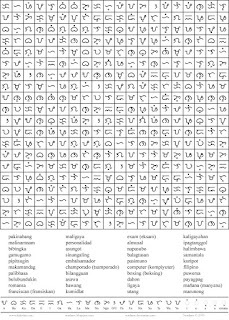 Baybayin Script Word-Finder is another radically unique modification to the classic word-finder puzzle that dramatically improves Baybayin character recognition and reading comprehension. 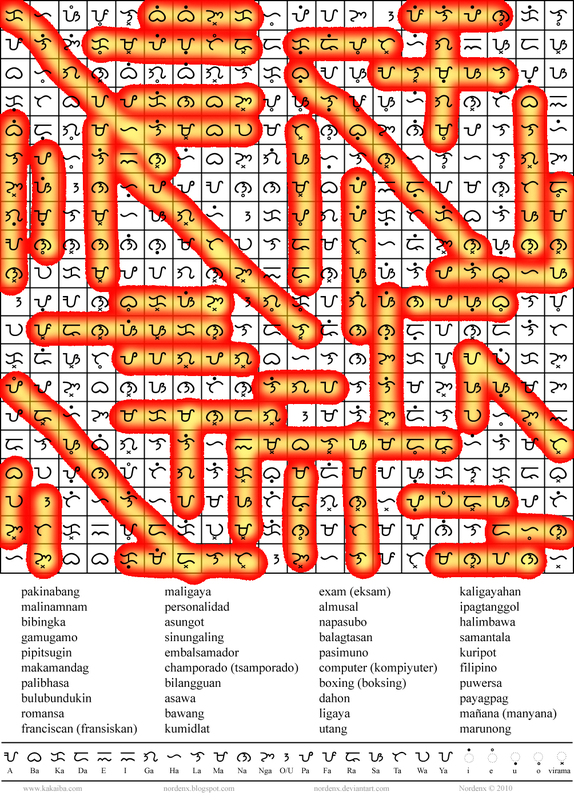 Baybayin Word-Finder has a similar format from the original version of the simple word-finder game that almost every grade-school child in the world is familiar with; however, instead of forming words by finding their corresponding alphabet letters, you have to formulate words using alphasyllabary. 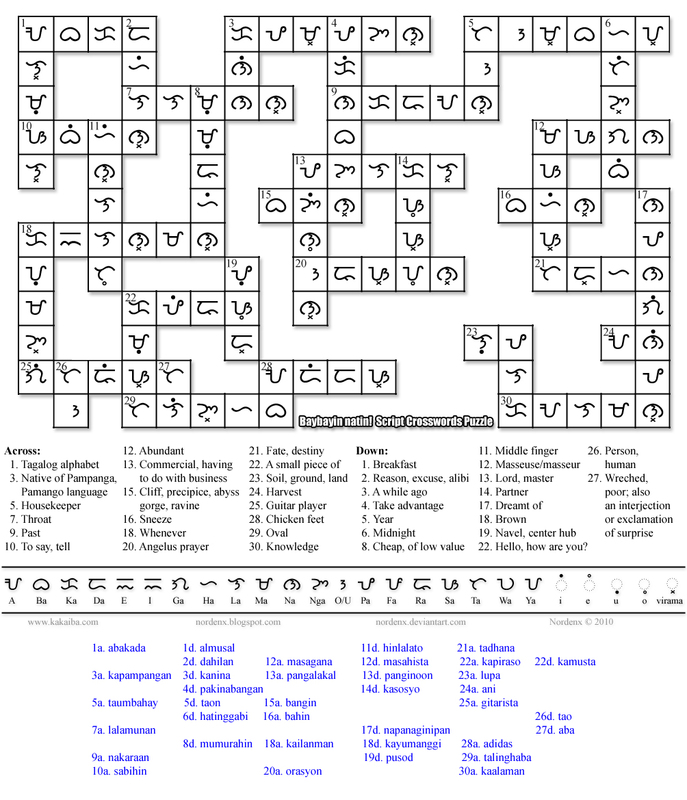 This puzzle challenges the person's Baybayin reading, Filipino phonetics, and syllabary skills. UPDATE: As recent research in typography & design came to light, the glyphs for E & I have been switched in all my fonts. The E & I in these puzzles remain as the old glyph assignment above. They will not be the same in future puzzles. UPDATE: Solutions to the puzzles above are now available.